Hello to Slingsbys all over the world, especially all of you who contacted last year!! This was a new project for 2007 which continued to be developed until about 2009 when circumstances meant that I was unable to continue. The site has remained up and running ever since and in 2015 people are still writing to me. Apologises to anyone in the past who wrote and did not receive a reply. Unfortunately the site might have remained online, but I didn't. However I am now in a position to spend some time on the site and hopefully bring it up to date and add some new and interesting news. The purpose of this site is to stir up as much interest in the Slingsby name as possible and to encourage people to share information including their ancestory. Slingsby is not a common name but seems to appear in the phone books of nearly every English region, in Ireland and no doubt in Scotland and Wales too. A quick search of the internet finds the Slingsby name listed in Canada,Â the US, Australia, New Zealand and South Africa. This is the first attempt at putting something together and I make no apology for the fact that it is rather amateur but this will change as I gain more experience. We had to start somewhere! We already have two major family trees here, the Slingsbys of Brayton, North Yorkshire and the Slingsbys of Idle, West Yorkshire, and I have more to add but we need all you Slingsbys to contact us tell us where you are in the world, and where possible share your Slingsby family history with us. The site has been up for 8 years and has been visited by Slingsbys from all over the world. These pages have generated a lot of interest and this year I am going to start redeveloping the site. You can contact me, at any time, but please be patient as it sometimes takes me a while to write back to everyone. The items listed in the menu on the left hand side of each page will take you to pages or other web sites containing interesting facts about Slingsbys including the execution of Sir Henry Slingsby for Treason, Slingsby Aviation, H.C. Slingsby, the Village of Slingsby, entries in Samuel Pepys' Diary, T. S Elliott, and many more. So take some time to enjoy them. I would welcome any contributions in the form of emails or articles or comment that would enrich our understanding of the development and diversification of the family. There must be many stories to tell out there, so if you are a frustrated writer try writing something for me to publish here! The latin inscription at the top of this page was originally on the front of the Red House at Moor Monkton, the 17th century residence of Sir Henry Slingsby (the elder). The inscription was moved to the Jacobean Chapel where it remains over the door to this day. "Pro Termino Vitae Sic Nos Nobis" is generally believed to translate as "For our term of life, so we build not for ourselves." An apt inscription for a web page so I have adopted it (if that's allowed). The Red House was the ancestral seat of the Slingsbys from 1560 until the turn of the 20th Century. The crest above is a stylised version of one attributed to the de Slingsby family of Scriven Park, and the Red House near Knaresborough, North Yorkshire. 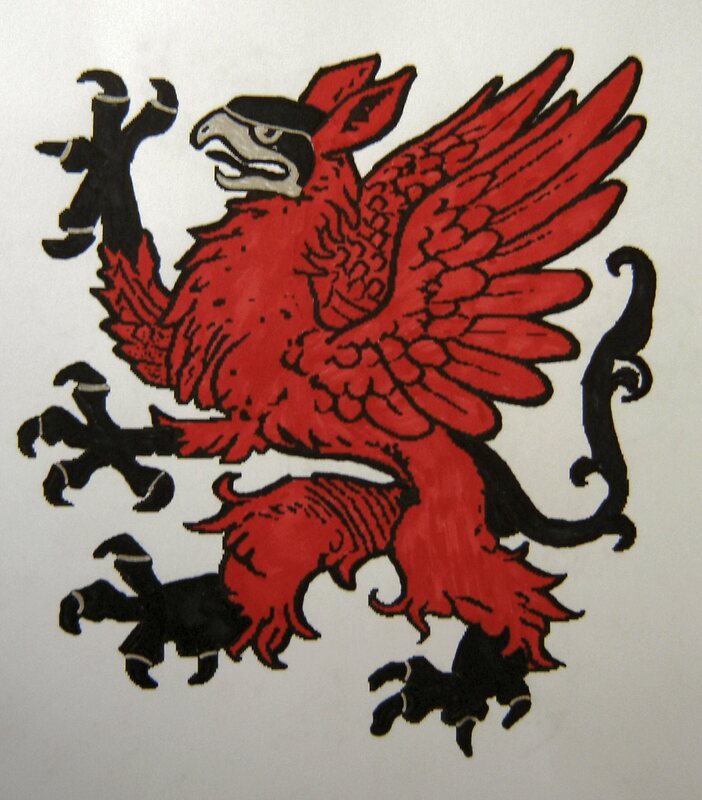 The original is a black Griffin with a red band across the middle described in heraldic terms as " a griffen segreant debrussed of a fesse gules." In the Parish Church of All Saints in Knaresborough there is a plaque on the wall of the Slingsby Chapel which depicts all the Coats of Arms related to this branch of the Slingsby family. The Slingsby family were influential in North Yorkshire especially during the English Civil War. While I can't claim a direct line to these Slingsbys they do provide an interesting starting point for this site. Further pages will document the early and colourful history of this branch of the family. To view the Coats of Arms click here. We have added our family tree to the site and will welcome any other contributors. However the site need not be limited to Slingsby family history. It should also inform and celebrate the achievements of Slingsbys today. If this is your first visit may I suggest that you start with Discover "Slingsby" which can be selected here or from the menu on the left hand side at the top of this page.